Radiotherapy primarily aims to stop the proliferation of tumor cells and to induce tumor cell death. It has however become more and more evident that ionizing radiation impacts the tumor cell phenotype and its microenvironment, thereby exerting both immunosuppressive and immune-activating effects. Therefore, a deeper understanding of how radiotherapy modulates the immune system is mandatory for the design of radioimmunotherapies, here defined as therapy combination of radiotherapy with immunotherapy. This chapter will summarize the current knowledge on how radiotherapy activates and suppresses the immune system, taking also into account the impact of radiation dose and timing of combination with immunotherapies on it. Immune biological challenges for combining radiotherapy with additional immune modulators are discussed. Based on the inflammatory status of a tumor, the dynamics and the interconnections of the immune system and the tumor are outlined. Finally, genetic and immune biomarkers for radiation responses are specified to better understand and to improve radioimmunotherapies for patients. It can be concluded that local and systemic antitumor immune responses can be induced by radiotherapy, but mostly only in combination with well-elaborated additional immune modulations. The primary goal of radiotherapy (RT) is to locally control the tumor (high tumor control probability, TCP) while sparing the surrounding normal tissue (low normal tissue complication probability, NTCP). Therefore, RT has long been regarded as local therapy only where ionizing radiation (IR) acts on the most radio-susceptible structure inside a cell, namely, the DNA. IR induces DNA damage directly or indirectly via production of radicals such as reactive oxygen or nitrogen species (RONS). DNA damage responses in tumor cells are followed by a stop in proliferation and ideally result in tumor cell death. Moreover, numerous other cellular processes are induced including stress responses of the endoplasmic reticulum (ER) which in turn result in a modified tumor cell surface and in an altered microenvironment (reviewed by (Frey et al. 2014; Wattenberg et al. 2014)). Elevated expression on the tumor cell surface can be found following RT for MHC molecules, stress ligands, adhesion molecules, death receptors, and activating ligands for immune cells. Additionally, neoantigens might be generated, and by the release of exosomes, danger signals, chemokines, and cytokines, a tumor microenvironment is generated that acts like an in situ adjuvant (Galluzzi et al. 2017). Taken together, these RT-induced modifications of the tumor cells and the microenvironment promote the tumor’s immunogenicity and provide the basis that the tumor is recognized by the immune system. Unlike other cell death forms such as apoptosis, necrosis, and mitotic catastrophe, radiation-induced immunogenic cell death (ICD) cannot be strictly categorized but is more functionally defined regarding its immunological consequences (Kepp et al. 2014). Stress response cells release different kinds of damage-associated molecular patterns (DAMPs) in a spatiotemporal manner. An inflammatory response is initiated when tissue is damaged and molecules inside cells which are not accessible for the immune system under physiological conditions are released into the extracellular space. Those are then recognized by immune cells as danger signals leading to the activation of the innate and adaptive immune system (Matzinger 2002). Among those danger signals released by irradiated cells are adenosine triphosphate (ATP), high-mobility group box 1 (HMGB1) protein, and heat-shock protein 70 (Hsp70). DAMPs favor maturation, antigen uptake and presentation of dendritic cells (DCs), and the consecutive activation of antitumor cytotoxic T cells (CTLs). In contrast, natural killer (NK) cells can also be activated directly by DAMPs (summarized in (Gaipl et al. 2014)). Upon IR, DNA is released into the cytoplasm acting as an intracellular danger signal usually found in infection or tumorigenesis (Desmet and Ishii 2012). Cytoplasmic DNA is sensed by the cGAMP synthase cGAS in tumor cells or DCs that received the DNA via direct cell-cell contact or exosomes (Diamond et al. 2018). cGAS then activates the stimulator of interferon genes (STING) which in turn triggers a type I interferon response. In particular, IFN-β released by DCs is important for immune responses after irradiation. DCs become activated and cross-present antigen to CTLs (Deng et al. 2014a). Next to the analysis of ICD characterized by the release of DAMPS after exposure to IR in vitro, additional in vivo experiments should be performed with immunocompetent mice. Two main approaches are helpful to determine the immunogenicity of RT-treated tumor cells. In the prophylactic setting, mice are immunized with treated tumor cells and challenged with viable tumor cells afterward. Only vaccination with immunogenic tumor cells is able to slow down or prevent tumor outgrowth. In the therapeutic setting, tumors are first implanted with viable tumor cells and then the tumor-bearing mice are treated. Inhibited tumor growth is here related to the immunogenicity of the treated tumor cells when a lacking tumor growth inhibition is observed when these experiments are performed with immune-deficient mice (Kepp et al. 2014; Kroemer et al. 2013). Not only DAMPs but also cytokines and chemokines such as CXCL16 are released after irradiation. The latter bind to CXCR6 on activated CTLs and favor their infiltration into the tumor (Matsumura et al. 2008) turning it from a “cold” to a “hot” tumor (Demaria et al. 2016). This RT-induced tumor-specific immune response may not only act locally on the irradiated tumor but may also attack metastases outside of the radiation field. However, this so-called abscopal effect, first theoretically described and termed in 1953 by Mole (Mole 1953), is rarely observed in the clinic since then (Abuodeh et al. 2016). One potential reason thereof might be that RT not only has the previously described immune-stimulating effects but also has immunosuppressive ones. RT was classically thought to kill all immune cells per se (Stjernsward et al. 1972). Findings of recent years, however, show an individual radiosensitivity of different immune cell types. Lymphocytes in general are more radiosensitive than macrophages, DCs or NK cells (Heylmann et al. 2014; Wunderlich et al. 2015). Langerhans cells in the skin are particularly radioresistant and contribute to immunosuppression by RT-induced migration into the lymph nodes and subsequent activation of regulatory T cells (Tregs) (Price et al. 2015). The exposition of immune cells to radiation during local RT is dependent on their localization. Immune cells circulating through the tumor vasculature only receive a low dose. Furthermore, the exposition of immune cells is dependent on irradiation planning and technique (Basler et al. 2018). Although there is evidence that immune cells are diminished in peripheral blood after RT, remaining immune cells seem to maintain their functionality (Belka et al. 1999). Consequently, the immunosuppressive effects of RT cannot be solely explained by immune cell killing. Further immunosuppressive properties of RT that prevent the tumor from being attacked by the immune system were recently summarized by Wennerberg and colleagues (Wennerberg et al. 2017): Monocytes are attracted into the tumor by the chemokine CCL2 that is released after RT. In the tumor microenvironment, they differentiate into tumor-associated macrophages (TAMs). Moreover, RT increases the expression of the transcription factor HIF-1α which is responsible for the regulation of several genes involved in immunosuppression, e.g., monocyte colony-stimulating factor (M-CSF; also named colony-stimulating factor 1, CSF1) or vascular endothelial growth factor (VEGF)-A. M-CSF polarizes TAMs to a more immunosuppressive M2 phenotype (Fujimura et al. 2018). VEGF-A additionally favors the proliferation of Tregs and activates myeloid-derived suppressor cells (MDSCs). TAMs often secrete immunosuppressive cytokines such as TGF-β, which suppresses cytotoxic T cells, drives the differentiation of naïve CD4+ T cells to Tregs, and polarizes macrophages to a M2 phenotype. Further, ectonucleases are found in the tumor microenvironment and degrade the previously mentioned danger signal ATP to adenosine which then suppresses DC activation and increases Treg proliferation and M2 macrophage polarization. 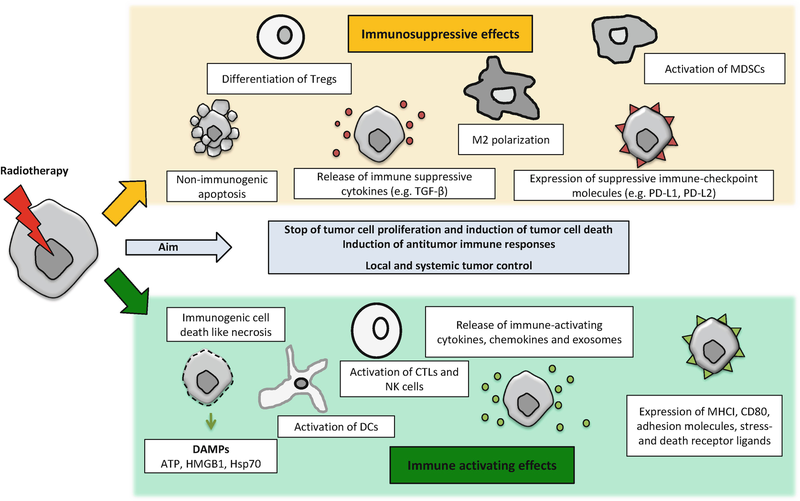 It seems that M2 macrophages are central in radiation-induced immunosuppression and are currently under intensive investigations in radiation oncology (summarized in (Herskind et al. 2017)). These circumstances indicate that the RT should be combined with immunotherapies to block all these immunosuppressive mechanisms (Kalbasi et al. 2017; Vanpouille-Box et al. 2015). A key reaction of the tumor to counteract the immune response is the upregulated expression of immune checkpoint molecules on tumor cells or tumor-infiltrating immune cells (Dong et al. 2002; Dovedi et al. 2014). Immune checkpoints are receptors on T cells which regulate their immune response. The ligands of inhibitory immune checkpoint molecules are expressed on antigen-presenting cells or on tumor cells to circumvent elimination by T cells. Immune checkpoint inhibitors are monoclonal antibodies blocking the receptor-ligand interaction. The most prominent ones are antibodies against cytotoxic T lymphocyte-associated antigen 4 (CTLA-4) and programmed cell death protein 1 (PD-1) on T cells or against the PD-1 ligands, namely, PD-L1 and PD-L2 (Pardoll 2012). Since CTLA-4 primarily regulates the activity of CD4+ T cells and PD-1 is the main regulator on CD8+ effector T cells, CTLA-4 acts on the early phase of T cell activation and PD-1 on the T cell response in the periphery including the tumor (Topalian et al. 2016). IR has strong impact on these immune regulatory properties as well. It was shown that in cell culture and in vivo in the tumor microenvironment, PD-L1 expression is upregulated upon RT and chemoradiation (RCT) (Deng et al. 2014b; Derer et al. 2016; Muraro et al. 2017). Thereby, RT dampens a pre-existing immune response. Figure 1 summarizes the discussed basal immune-activating and immunosuppressive properties of RT. The most immunogenic dose of radiation has not been identified yet, if there is any for all instances. The initiation of an immune response is a dynamic process composed of several steps: first a stimulus creates a tumor microenvironment which favors the infiltration of immune cells from the periphery. Those immune cells have to enter the tumor via blood vessels and antigen-presenting cells such as DCs need to be activated by DAMPs. After the uptake of antigens they home to draining lymph nodes and (cross-)present the antigen to T cells. Then CTLs need to migrate back to the tumor to fulfill their cytotoxic tumoricidal purpose. This manifoldness in processes that contribute to an antitumor immune response suggests that all steps might be diversely affected by different doses of ionizing radiation. Here we will shortly focus on immune cell infiltration and on the immunogenic tumor microenvironment. Preclinical experiments have shown that with a single dose of 1Gy or 2Gy, the tumor vasculature is being normalized and more T cells infiltrate into the tumor (Klug et al. 2013). This infiltration was accompanied by an accumulation of M1 macrophages that produced iNOS upon irradiation. The resulting release of nitric oxide was responsible for normalized vasculature and recruitment of T cells. It was further shown for a single dose of 2Gy as well as a high dose of 20Gy in in vitro models by Hennel and colleagues that human breast cancer cell lines release nucleotides upon IR which promote monocyte migration (Hennel et al. 2014). One major factor to activate the attracted immune cells is the induction of ICD which was increasingly observed for higher single doses, e.g., 5Gy or 10Gy (Golden et al. 2014). Research by Vanpouille-Box, however, indicates that excessive irradiation with doses above 12Gy might again be less effective. DNA exonuclease Trex1 expression is caused thereby which degrades cytosolic DNA and subsequently blocks the type I interferon response via the cGAS/STING pathway (Vanpouille-Box et al. 2017). Deng and colleagues showed that only a combination of RT (1×12Gy) and anti-PD-L1 therapy is capable of retarding tumor growth of the irradiated as well as non-irradiated tumor (Deng et al. 2014b). The antitumor immune response relied on CD8+ T cells secreting TNF-α and thereby counteracting suppressive MDSCs. This demonstrates that various interlocked mechanisms are involved in the induction of antitumor immune responses. Further preclinical work indicates that after norm-fractionated irradiation (5x2Gy), already pre-existing T cell clones expand in the irradiated tumor and only there PD-L1 expression is upregulated. A combination of RT with anti-PD-1 antibodies circumvents this immunosuppression and initiates local as well as systemic immune responses against the tumor with pre-existing as well as newly infiltrating T cells being involved (Dovedi et al. 2017). To successfully combine RT and immunotherapies, it is crucial to know whether a tumor is inflamed (“hot”) or non-inflamed (“cold”). Hot tumors that are mainly characterized by the infiltration of CD8+ T cells respond better to immune checkpoint inhibitors (Gajewski 2015; van der Woude et al. 2017). In pancreatic tumors, the combination of RT with a vaccine can increase the infiltration of tumor-specific CTLs which makes further combination with anit-PD-L1 antibodies even more effective (Zheng et al. 2016). One could conclude that the most effective therapy to induce local as well as systemic antitumor immune reactions is based on RT as an in situ cancer vaccine together with an additional boost with immunotherapies, e.g., vaccines (van der Burg et al. 2016) and/or immune checkpoint inhibitors to restore pre-existing antitumor immune responses (Rückert et al. 2018). An alternative to vaccines are immunocytokines to activate immune cells. They consist of tumor-specific monoclonal antibodies coupled to cytokines such as IL-2. T cells are activated by IL-2, but an unspecific infusion leads to severe side effects (Rekers et al. 2015). RT combined with the immunocytokine L19-IL2 not only induces abscopal immune responses but also long-lasting immunological memory against the tumor (Rekers et al. 2018). IL-12 proved to be effective for the induction of systemic antitumor immune responses in preclinical examinations with immunocytokines, too (Eckert et al. 2017a). In a breast cancer mouse model with a subcutaneous tumor on each flank, it was demonstrated that only the combination of RT and the growth factor Flt3-L retards the tumor growth in the non-irradiated tumor as well (Demaria et al. 2004). In a proof of principle study with non-small cell lung cancer and breast cancer patients, it was shown that local RT plus GM-CSF can induce such abscopal immune responses (Golden et al. 2015). Another way to turn tumors “hot” is the interception of immunosuppressive cytokines as, for instance, indoleamine-2,3-dioxygenase (IDO) (Prendergast et al. 2018; Molinier-Frenkel and Castellano 2017). It has to be stressed that for every combination of RT with immunotherapies the most appropriate dose per fraction to induce the best CTL-dependent immune reaction needs to be evaluated (Morisada et al. 2018; Filatenkov et al. 2015; Eckert et al. 2017b). The synergy of RT and immunotherapies seems to be responsible for the induction of systemic antitumor immune responses, but it remains unclear how stable this synergy is and how to maintain it during treatment. Antitumor immune responses are based on dynamic processes. Antigen-presenting cells are attracted and activated by an immunogenic tumor microenvironment. Antigen is taken up in the tumor, and in draining lymph nodes, it is presented to T cells followed by their activation and clonal expansion. The question of when the lymph nodes need to be spared during RT to prevent interference with the activation of a T cell response is of high relevance. In a preclinical study, it was recently demonstrated that tumors grow faster when CTLs are hindered from emigration out of lymph nodes (Zhang and Niedermann 2018). Further, irradiation of lymph nodes again in a preclinical model system attenuated the combinatorial efficacy of stereotactic radiation therapy and immunotherapy (Marciscano et al. 2018). Nevertheless, also T cells that are already present in tumor contribute to radioimmunotherapy-induced antitumor immune response (Dovedi et al. 2017). However, the spread of metastases via lymph nodes needs to be considered as well (Ullah et al. 2018). 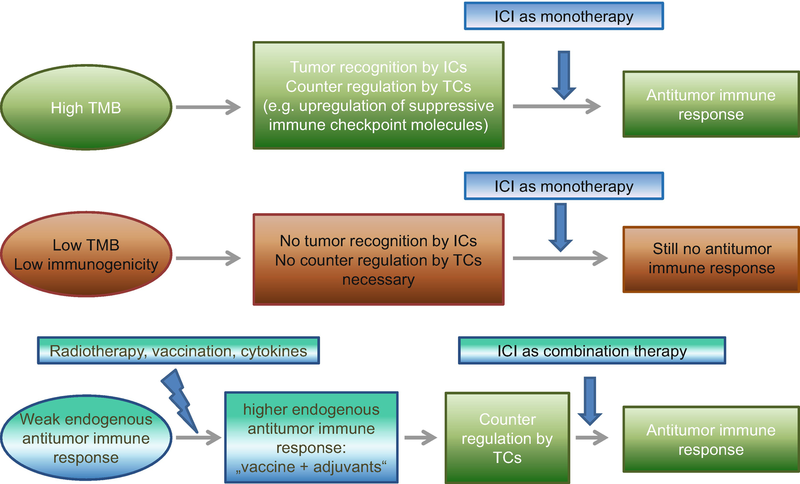 For the combination of RT with immune checkpoint inhibitors, dynamic processes of the tumor phenotype seem to be of importance. Preclinical data in particular demonstrate that a concurrent administration of both RT and checkpoint inhibition is most effective. Dovedi et al. combined in a mouse model fractionated irradiation of 5×2Gy with anti-PD-L1 antibodies starting at different time points. Only the administration beginning with the first or last irradiation significantly prolonged the survival of the mice, whereas checkpoint inhibition 1 week after the last irradiation did not (Dovedi et al. 2014). The underlying mechanism might be the temporarily increased expression of PD-L1 on the tumor cell surface but also the temporary PD-1 expression on CD4+ and CD8+ T cells. A blockade of PD-L1 with durvalumab after RCT significantly prolonged the progression-free survival in a phase 3 clinical trial with stage III non-small cell lung cancer. Most notably, patients that received the checkpoint inhibitor shortly after the RT profited the most (Antonia et al. 2017). For most tumor entities, the success of an anti-PD-L1 therapy in the clinic so far turned out to be independent on the PD-L1 status in the tumor (Xu-Monette et al. 2017). However, this might be due to different antibodies used for diagnostics but also biopsies that are analyzed before RT or RCT. Recent studies show that PD-L1 expression is only gradually increased after irradiation (Takamori et al. 2018) and is also present on circulating tumor and stromal cells aft RT (Adams et al. 2017). In future studies PD-L1 expression should be evaluated after RT and RCT as well to be able to further optimize radioimmunotherapies and to better stratify patients (Antonia and Ozguroglu 2018). Furthermore, the time points of irradiation during a fractionated radiotherapy themselves should be considered because of a timely restricted infiltration of immune cells into the tumor after RT. It was previously shown in a mouse model with syngeneic CT26 tumors that macrophages and DCs increasingly infiltrate 5 days after the first irradiation with 2×5Gy. CD8+ T cells had their peak infiltration 8 days after the first irradiation (Frey et al. 2017a). Hettich and colleagues reported a similar timely restricted infiltration of CD8+ T cells in a B16 melanoma model with 2×12Gy irradiation on consecutive days (Hettich et al. 2016). These results indicate that irradiation of the tumor on days with high immune cell infiltration should be avoided to protect radiosensitive T cells. However, even if some T cells are killed by irradiation (Basler et al. 2018), the remaining ones can still be functional (Belka et al. 1999). In a preclinical model system, even RT schedules with irradiation at time points of high immune cell infiltration achieved antitumor immune responses comparable to those terminated before (Zhang and Niedermann 2018). Another dynamic process important in radioimmunotherapy is T cell exhaustion. A combination of RT and anti-CTLA-4 therapy is capable of inducing a local and abscopal immune response. Anti-CTLA-4 primarily acts on Tregs (Chaudhary and Elkord 2016) resulting in a favorable higher CD8+ T cell/Treg ratio, and the irradiation expands the repertoire of intratumoral T cells. However, the combination of both can render the T cells functionally inactive. To overcome this issue a double immune checkpoint inhibition can be efficient. An additional PD-1/PD-L1 inhibition was shown to reverse T cell exhaustion and to promote their oligoclonal expansion (Twyman-Saint Victor et al. 2015). To date it is still a big challenge to identify patients who respond to immunotherapies and in turn to understand why the majority does not. For some patients who have received immunotherapies before, RT might still be an essential trigger to elicit antitumor immune responses (Luke et al. 2018). Therefore, even partial irradiation of tumor lesions with stereotactic RT is under discussion as vision. To address the various and individual interactions between the immune system and the tumor dividing patients in responders and non-responders, appropriate biomarkers need to be found. Since this interaction is multifactorial, most probably combinations of biomarkers will be required (Blank et al. 2016). Neoantigens originated from DNA damage drive T cell-mediated antitumor immune responses. However, they are not necessarily permanently acquired. Therefore, broad neoantigen-specific T cell responses are favorable (Verdegaal et al. 2016), and a high tumor mutational burden (TMB) is a predictor for the response to immune checkpoint blockade (Goodman et al. 2017). So far it is not known whether RT per se induces neoantigens, but the pre-existing peptide repertoire is modulated, and the RT-generated microenvironment promotes antigen presentation. Among others a changed MHC class I-associated peptide profile more effectively initiates a cytotoxic T cell response (Reits et al. 2006). Currently, several tests using next-generation sequencing or whole exome sequencing are under development to reliably analyze the TMB although these methods are still expensive. Based on the high TMB related to a mismatch repair deficiency (Le et al. 2017), the FDA for the first time approved the anti-PD-1 antibody pembrolizumab for solid tumors independent of the tumor entity. In addition to the somatic mutational prevalence (Alexandrov et al. 2013), also germ line genetics affect the responsiveness to immune checkpoint inhibitors. Antitumor immune responses are highly dependent on CD8+ T cell responses, and therefore heterozygous HLA I loci represent predictors for the immunotherapy responders as well (Chowell et al. 2018). Besides genetics, the immune system plays a pivotal role for prediction and prognosis of radioimmunotherapies. In a melanoma patient under long-lasting immunotherapy, HLA-DR expression was increased on monocytes in peripheral blood upon additional RT (Postow et al. 2012), having given first hints that the response of a tumor to radioimmunotherapy can be monitored individually in peripheral blood. The frequency of CD14+, CD16+, and highly HLA-DR-expressing monocytes in peripheral blood was identified as a predictor for the progression-free and overall survival of patients with stage IV melanoma after anti-PD-1 immunotherapy (Krieg et al. 2018). Multicolor flow cytometry allows profound analysis of immune cells, their subpopulations, and activation status from few ml of whole blood in a fast and highly reproducible manner (Rühle et al. 2016). The close-meshed immune monitoring of a glioblastoma patient with favorable therapy showed a decreased CD4+/CD8+ T cell ratio and higher eosinophil frequency during the treatment which were both reversed with a relapse (Rühle et al. 2017). Eosinophilia is associated with good prognosis for melanoma as well (Moreira et al. 2017). Furthermore, DAMPs such as Hsp70 in peripheral blood correlate with tumor size, as shown for non-small cell lung cancer (Gunther et al. 2015). Additionally to the adaptive immune system, also the innate immune system is involved in radioimmunotherapy-induced antitumor immunity. Therefore, studies are ongoing testing the potential of RCT combined with NK cells activated against Hsp70 which is also present on the tumor cell surface (Specht et al. 2015). Especially patients not responding to immune checkpoint blockade might benefit from such approaches. To evaluate the response of patients to radioimmunotherapies, multifactorial biomarkers should be analyzed which consider genomic parameters such as the mutational burden, as well as immunological parameters such as CD8+ T cell frequencies, tumor phenotype, PD-L1 expression, or the peripheral immunological status (Topalian et al. 2016). Reasoned translational accompanying research alongside clinical trials will be mandatory to have reliable multifactorial biomarkers for prognosis and prediction available in the future. It has to be emphasized that the so-called cancer immunogram is a dynamic construct which constantly needs to be complemented, revised, and individualized (Blank et al. 2016). Giraldo and colleagues analyzed the immune status in the tumor, surrounding non-tumor tissue and peripheral blood of patients suffering from localized clear cell renal cell carcinoma and found a correlation of high infiltration of CD8+ T cells with poor prognosis. Further analysis showed a high expression of PD-1 in those T cells. Therefore, detailed immune phenotyping is mandatory to get reliable prognostic and predictive values for immune cells. Multicolor flow cytometry revealed that 20% of patients that have dysfunctional tumor-infiltrating lymphocytes expressing immunosuppressive molecules such as PD-1, CTLA-4, T cell immunoglobulin and mucin-domain containing-3 (TIM-3), or inducible T cell co-stimulator (ICOS). These patients had significantly shortened survival and higher risk of disease progression in the first year after nephrectomy. However, this immune cell phenotype could also be found in peripheral blood (Giraldo et al. 2017). Therefore, multifactorial and combined biomarkers will be the future (Levy et al. 2017). It is obvious that still various challenges remain for the design of ideal radioimmunotherapies and in particular for patient stratification (Reynders et al. 2015). Furthermore, classical irradiation schemes need to be reconsidered, and treatment planning should be optimized to the current immune status of the patient (Basler et al. 2018). Norm- and hypo-fractionated RT might be applied alternately to recruit immune cells into the tumor (Klug et al. 2013; Safi et al. 2015; Frey et al. 2012) and to induce immunogenic cell death as well (Vanpouille-Box et al. 2017). Some irradiation protocols will turn the tumor in an in situ vaccine, which can be boosted with additional vaccination or immunocytokines (Zheng et al. 2016; Rekers et al. 2015). The application of cold plasma or plasma-activated media might be an additional future treatment modality (Liedtke et al. 2017). Nevertheless, the tumor always tries to counteract immune attacks. This is achieved by the expression of PD-L1, PD-L2, or other immune checkpoint molecules as well as secretion of suppressive cytokines such as TGF-β or IDO. Again, counteraction of these immunosuppressive mechanisms in sum enables the induction of a long-lasting immunity against the primary tumor and metastases (reviewed by (Rückert et al. 2018; Frey et al. 2017b)). The most effective combination and chronology of different RT concepts and immunotherapies need to be determined using multifactorial biomarkers and simulations with mathematical models in prospective clinical trials. Figure 2 summarizes the concept why combinations of RT with immunotherapies are promising for a subset of patients. Luke JJ, Lemons JM, Karrison TG, Pitroda SP, Melotek JM, Zha Y, et al. 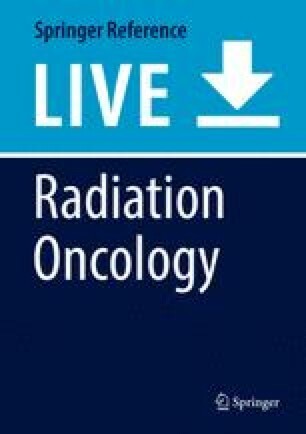 Safety and clinical activity of pembrolizumab and multisite stereotactic body radiotherapy in patients with advanced solid tumors. J Clin Oncol. 2018. https://doi.org/10.1200/Jco2017762229.